HARNESS DESIGN have been in business since 1990 providing there customers with the best wheelchair gloves possible. They incorporate the finest materials and workmanship into original, innovative designs that are the result of collaboration with wheelchair users like yourself from around the world. You'll make every stroke count with our specially formulated rubber push surfaces which grip well in both wet and dry conditions. Racing gloves are padded to absorb shock with foam that will hold its shape for many miles. Stay off the seams, push primarily on the fingers, let the gloves dry out after every use, and the standard racing gloves are good for about 1000 miles. Harness Design guarantee materials and workmanship for 30 days, so if you have a problem just give us a call and we will contact Harness Gloves. 2 POCKET MITT QUAD (2 PQ) - The rubber push surface extends higher onto the back of the hand to accommodate a quad backhand stroke and a patch of rubber is added to the palm for contacting the ring when pushing steep hills. 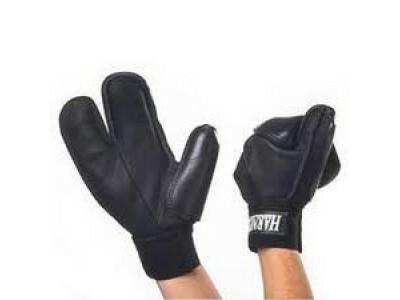 STANDARD - Standard mitts and gloves are made on leather base gloves with rubber push surfaces and tab closures and there is full ½" padding over the index and middle fingers, ¼" on quads, and ¼" over the thumb. If you don't specify any options, this is what you're going to get. Available by special order. 1/2 PADDED - ¼" padding over the index and middle fingers. Less padding here can increase the tactile feel of the glove against the ring but can also increase bruising on the fingers from impact. This option is not available on quad styles. Our stock glove option. TAB CLOSURE - The purpose of the tab closure is to unify the hand and fingers, stabilise the push surface, and maintain the hand in an optimal push position. Both can help reduce blistering and improve the effectiveness of your contact with the ring. This also allows you to relax your fist while pushing, while maintaining the shape, reducing forearm fatigue. Our stock glove option. Because using gloves with tabs may restrict your hand movements and dexterity, we strongly encourage you to re-familiarise yourself with steering and brake controls when first using gloves with tabs. If you're not sure if you want to use tabs, we recommend that you order your gloves with tabs, try them and if you don't like using them you can cut them off. 1 - Measure your palm girth as shown above. 2 - Measure length from the bend in your wrist to the tip of your longest finger.